Sign up and receive Property Email Alerts of Houses to let in Constantia, Cape Town. Fabulous kitchen with scullery and pantry, casual dining and tv/easy lounge area opening onto back garden with trampoline. Easy to maintain garden, with beautiful trees and expansive lawn. 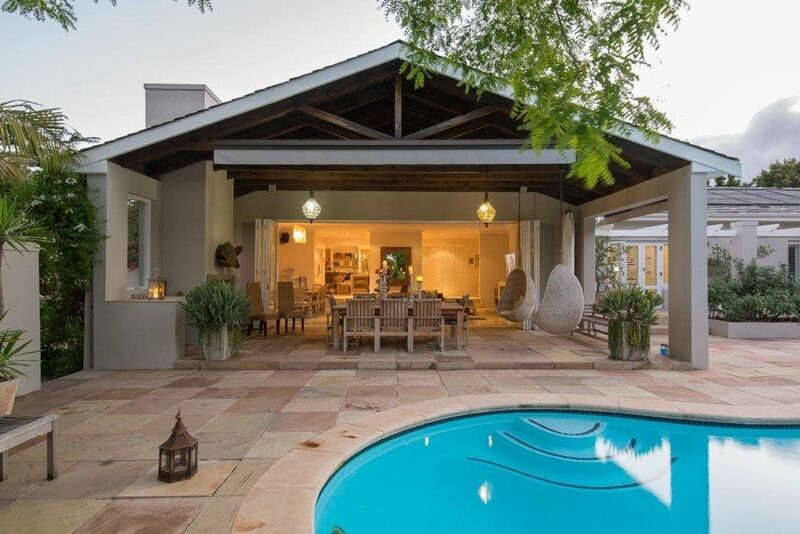 Front lounge and dining opens onto covered spacious patio and braai area in stunning front garden with jacuzzi and pool. Generous lawn and garden area. Main en-suite with dressing room. Exceptionally large study/work-from-home office or 4th bedroom/guest room also en-suite. 2 other bedrooms each with own bathrooms. American security shutters in each bedroom and bathroom. Electric fencing and excellent security system. Double garage with ample parking for 4 or 5 cars. Impressive driveway. Sign-up and receive Property Email Alerts of Houses to let in Constantia, Cape Town.